Some of the best recipes are filed away solely in memory. As awesome as this is, it can mean that unless one coverts the recipes to paper or blog before the recipe creator passes, their cherished recipes can pass right along with them. This is the case with some of my Mom’s and virtually all of my Maternal Grandmother’s recipes! Lucky for me my Mom curated two cookbooks so I have a few hundred recipes for my tastebuds to feast upon (you, too, if you fully experience this blog). The only recipes I have from my Dad are the cherished few that he taught us in person and I don’t have any of my Paternal Grandparent’s (or beyond) recipes. I hope this blog will put a digital stake (steak) in the ground and break my family’s culinary recklessness as I archive many of the recipes fueling my childhood. 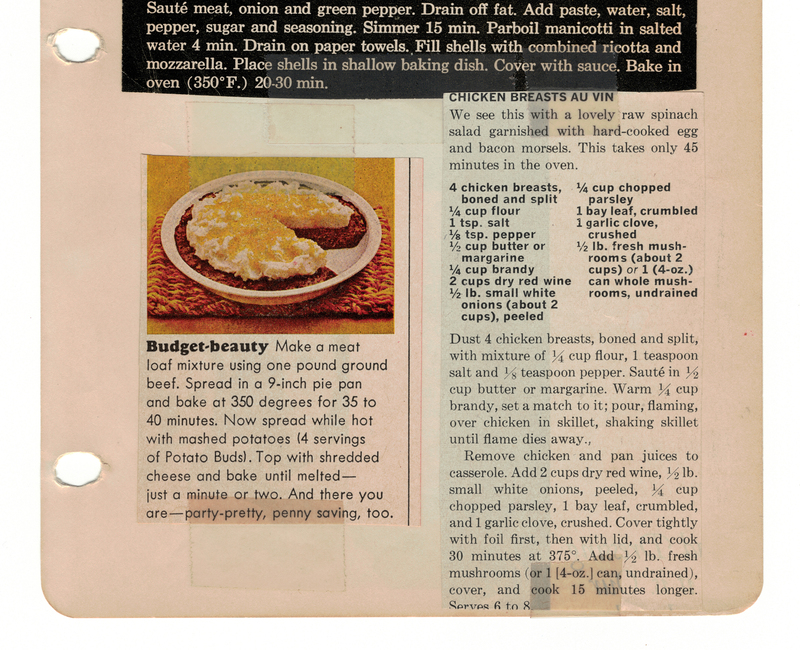 So far, I’ve published more than 130 recipes … and I have a healthy appetite to keep ’em rollin’! So given the ease in which some foodies “just remember” how to create in the kitchen, I was not at all surprised that this recipe simply calls for us to literally “make a meat loaf mixture” … yet there is no detail for how to do so! Yeah, I don’t know how to do that! 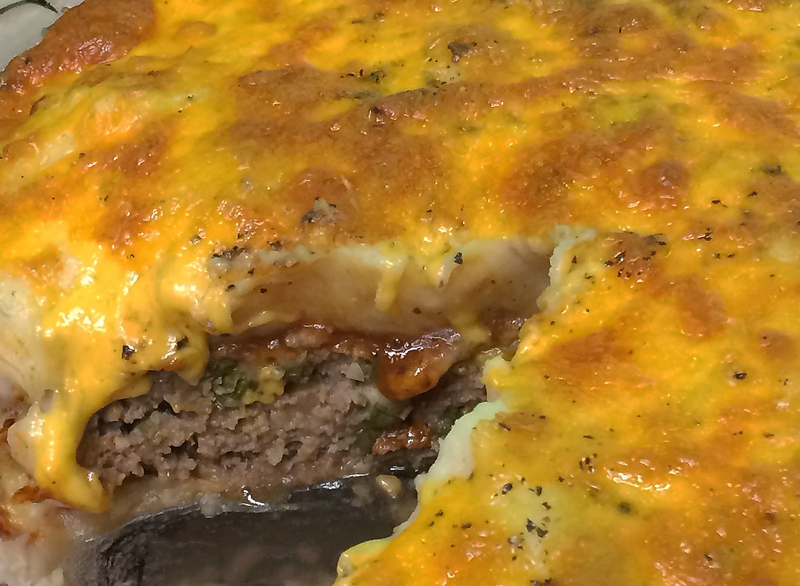 Joe found and adapted an easy-to-make meat loaf recipe so I included the details below if you need a little help making your meat loaf. Feel free to substitute this loaf recipe with your very own favorite; this dish is extremely forgiving – Hello, it’s graced with instant mashed potatoes! ❤ The discerning foodie eye will likely notice that I doubled the servings of mashed potatoes for the top of the meat loaf medley. Eight servings tasted even better – no paper-thin smears of the fluffy stuff for me! Nah, I just won’t do that. Neither would the original Meat Loaf. ❤ To toast the cheese on top of the meat loaf to a golden brown, as shown, place it under your oven’s broiler for a couple of minutes. 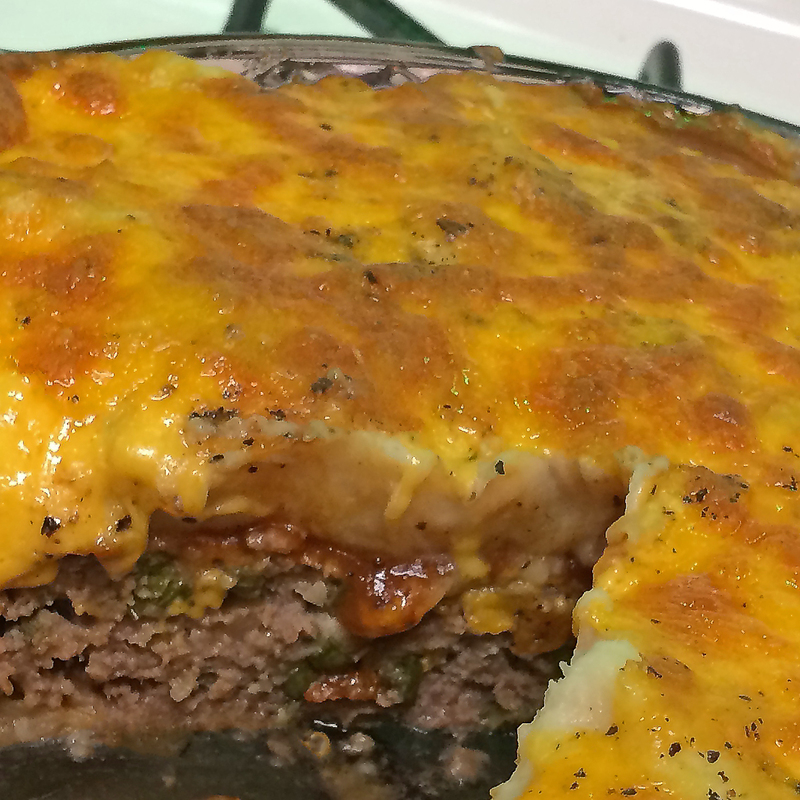 ❤ Most Moms have a favored meat loaf recipe. If you don’t already know hers beyond the heart, I encourage you to get your Mom (or Grandmother) to give you the recipe details so you can safely secure and share it with foodies to come! 1. Combine all meat loaf ingredients except the ketchup in a large bowl, and mix well. Place the meat loaf mixture into an ungreased 9-inch pie pan and spread the ketchup or barbecue sauce over the top of the loaf. 2. Bake uncovered for about an hour, until no pink remains in the center of the meat loaf (the internal temperature should be ~160 degrees). 3. 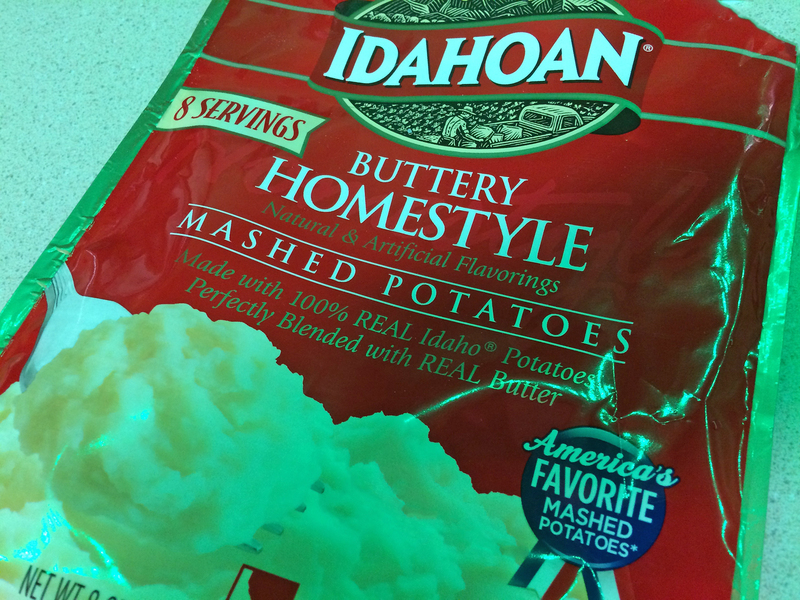 Just before the meat loaf is done, make the mashed potatoes according to the package instructions and set aside. If you want to add some butter, I won’t tell! Make sure and use Falfurrias brand butter because that’s what my Grandmother “Nanny” (Betty’s Mom) always used. 4. Remove the loaf from the oven and spread the mashed potatoes on top. 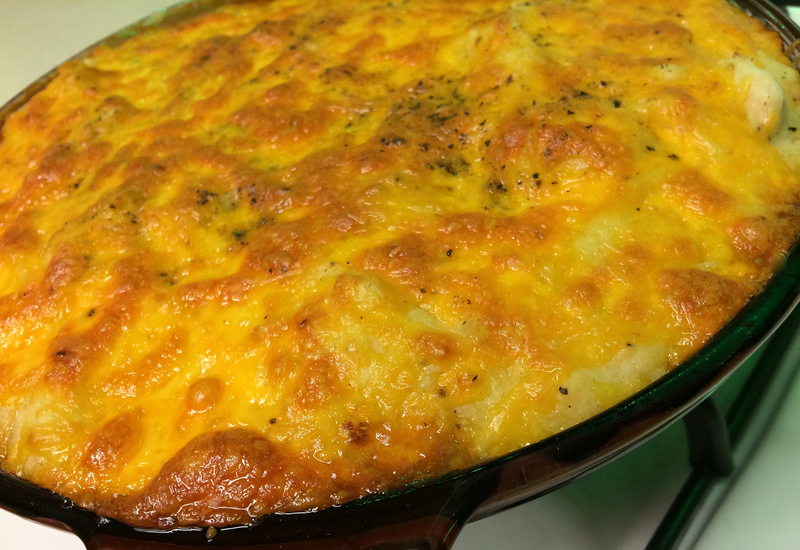 Sprinkle with cheese and return to the oven for a couple of minutes, until the cheese is all melted and toasty good. 5. Remove from the oven and let rest a few minutes and serve. We enjoyed ours by the spoonful. In case you missed the multiple plugs to Meat Loaf (the musical one), here’s one more treat you might “loaf” just as much as this dish! Stop. Drop. And Egg Roll. Before P.F. Chang’s, there was “King Wah”. King Wah was the nicest Chinese food restaurant I had ever been to… until years later when my cousin Melissa married in San Francisco; after the ceremony we ate at a fancy Chinese food restaurant called the Empress of China, which was a beaut. Flash back 1980s. King Wah was located in a white office building at the SE corner of Loop 410 and Wurbach road (1800 NE Loop 410) in my childhood home town of San Antonio. white table cloths, fancily dressed wait staff and large round tables that the expanded family would gather around. Why, there must have been 10-12 of us feeding at a single table! While I only ate at King Wah with my Aunt Sister, Uncle Bill and the wolf pack (my cousins), it was one of the few times I can remember that felt more Thanksgiving than mere Chinese dining. King WOW! Today I live precisely 270.42 miles from where King Wah was located. But thanks to this savory lip-smacking recipe featuring the egg roll, I can relive the mouth-watering memories growing up… and the taste of the exotic orient. I will be eating this again! 0. Preheat oven to 250°F. 1. Combine soy sauce, sherry, sugar and salt. Add to beef strips and ross to coat with mixture. Let stand 15 minutes, turning occasionally. 2. Heat 2 tablespoons of the oil in a large skillet over moderate heat. Add Chinese pea pods and cook until pods have separated from one another and they’re tender crisp, about 2 minutes. Remove pea pods from skillet and reserve. 3. Add the remaining 2 tablespoons of the oil to the skillet. Add beef strips and cook, stirring occasionally, until the beef loses its pink color. 4. Add celery, scallions, bean sprouts and consomme. Reduce heat to low (about 225°F). Cook, covered, a few minutes until vegetables are almost tender. 5. Stir cold water slowly into the cornstarch and add to skillet mixture. 6. Blend well and heat, stirring constantly, until mixture is smooth and thickened. 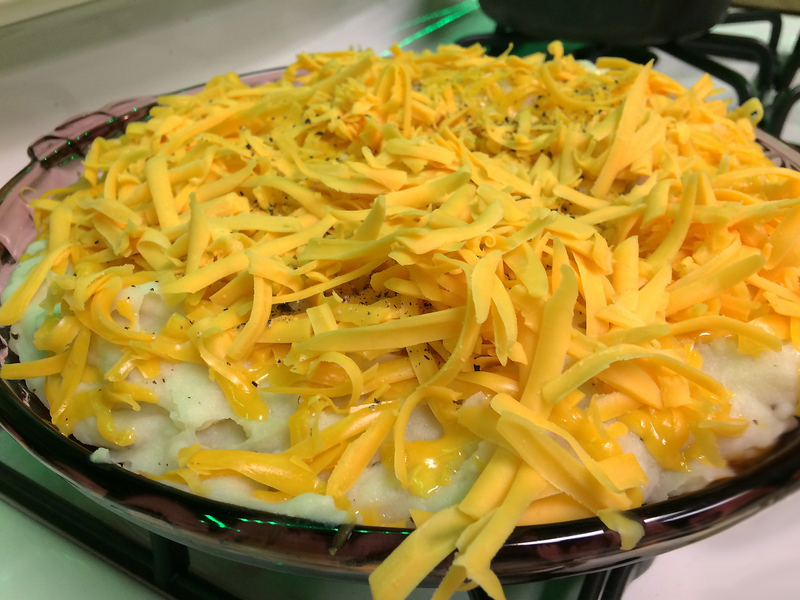 Pour into a greased 1½-quart shallow casserole. 7. 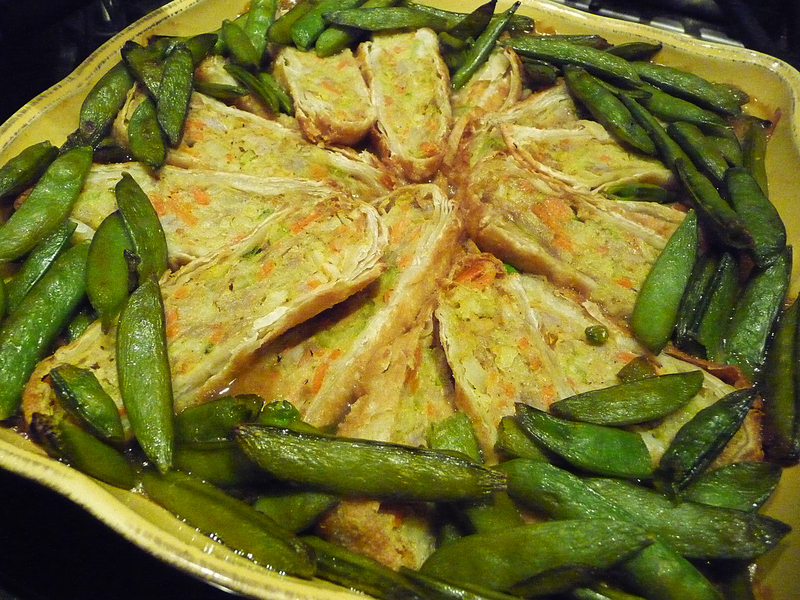 Cut egg rolls in half lengthwise and place spoke-fashion on middle top of casserole. Arrange cooked pea pods at edges of casserole. 8. Place in a preheated 350°F oven for about 25 minutes, or until rolls are crisp on top. Serve with rice, if desired? 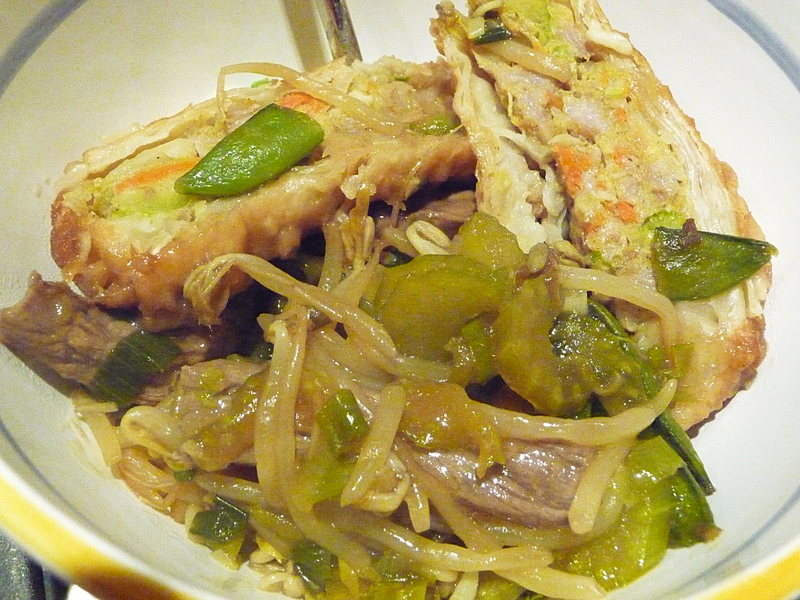 ♥ While the egg roll flavor was not specified, because this recipe calls for beef round, I suggest a simple veggie egg roll to accompany the beef. ♥ What’s a “Chinese Pea Pod?” It’s also known as a Snow Pea or a Sugar Pea. Technically they’re different than edamamme (a sweet bean). You’re likely to find them frozen vs. fresh at your local grocery. ♥ “Serve with rice, if desired?” Of course it’s desired! Get outta my way ~ I’m hongry!